Sweet sweet baby chicks. We treated ourselves to three Easter Eggers/Aracaunas/Ameracaunas a few weeks ago. Why? As I mentioned, our sweet Lavender passed away unexpectedly. Then a few weeks ago Fat Rosie started walking funny. And she wasn’t fighting all of the other ladies for every.single.scrap.of.food. Which was very out of character and somewhat worrisome. Then one day I saw that she had been in the nesting box for a very long time and that she seemed to be struggling a bit. I assumed that she was egg bound and decided that once Rob got home, we would take the plunge and help a lady out. Whoa. Chicken insides are weird, man. I gloved up and provided Rosie with some Aquaphor. To my dismay, there was no egg. Like, at all. But there was a whole bunch of jiggly water-balloon happening. I turned to the ever helpful Backyard Chickens Forum and it would appear that Rosie was suffering from ascites. Which is no bueno. I gave it a few days hoping an egg would magically appear, but her belly became more and more swollen and she was forced to sit down every few steps. After further researching, I was confident that our poor girl was really suffering. What happened next is Farmer Bob’s story and I do not wish to go into detail. Let’s just say he’s still a little worse for the wear. 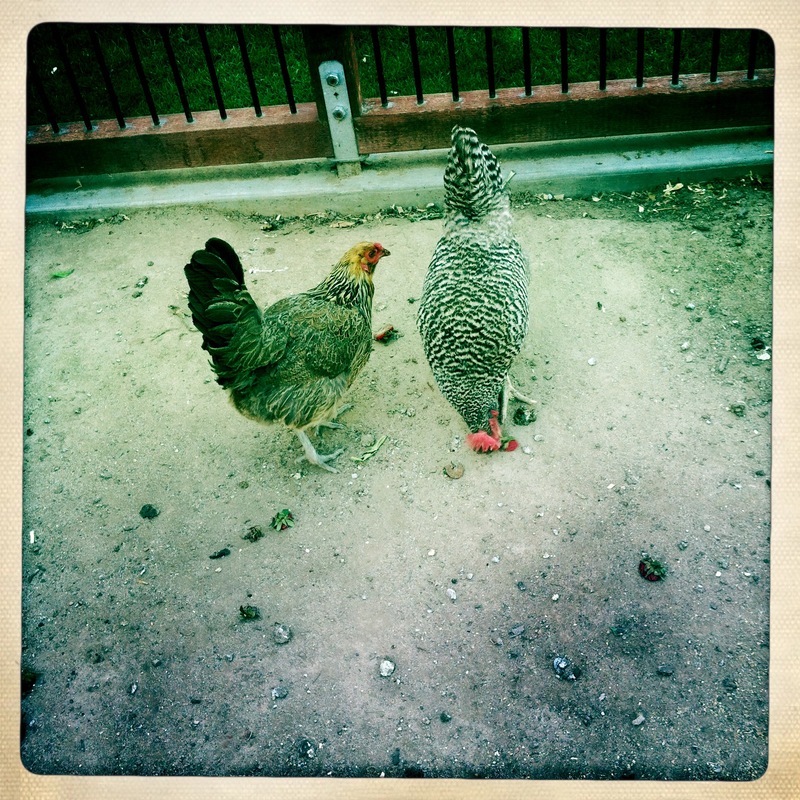 To help ease the trauma, we picked up these three sweet chick-a-dees from a guy in Mount Helix. They are feisty! The three chicks put us back at our max of 10 birds. Our full grown egg-laying ladies are Agnes, Prudence, Millicent, Florence, Ginger, Henrietta and Gertrude. The new babies are Olive, Elliemay Elmer, and Beverzulene. Elmer is leggy. And has some big ol’ feet. After our experience with GoldaLee/King Midas, I’m pretty sure Elmer is a dude. But here’s the kicker. A friend of Rob’s thought she might need to get rid of her chickens. Rob offered to adopt them about a week before we bought chicks, but she thought she would keep them. And so we got the chicks. And then she changed her mind again. And so we have 12 chickens. 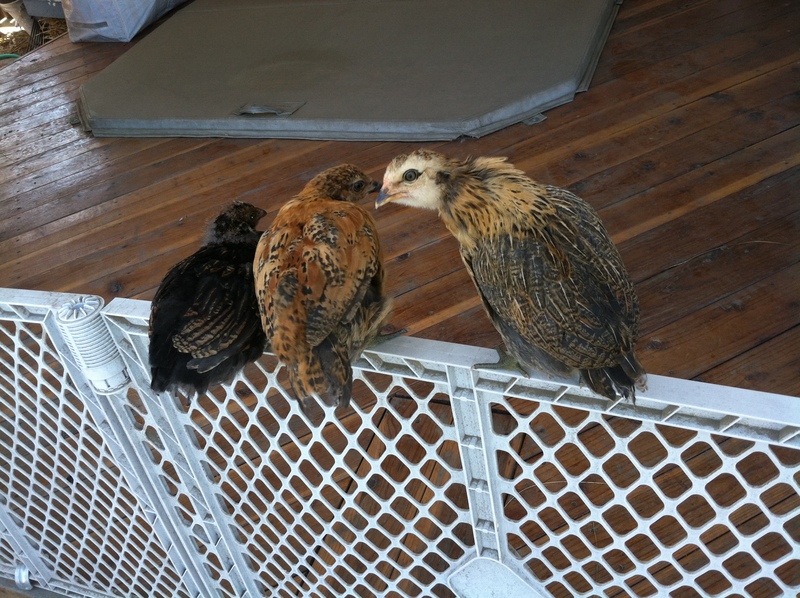 Ophelia nee Oreo and Babette nee Butterscotch joined our flock in April. Within 24 hours Ophelia had literally flown the coop. A tale which probably deserves its own post. Welcome to the club, ladies. I think, for now, the flock shall be known as The Dirty Dozen. Your post is pretty good to read. Excellent!! Thank you for sharing, could I post it on my Tumblr to share with my families? Hi Jack- Glad you liked the post. Feel free to share!